No matter how “arty” an interest is, disciplined regular practice is the best path to enjoyment. Developing and getting progressively better at something is rewarding – whether it be gardening, knitting or something like photography! There are plenty of people who take lots of photos – and happy to get the same results time and time again. 1. Identify a new technique or style to explore. If you don’t write something down, you aren’t really learning it. I use both this blog, and good old fashion analogue notebooks to write down what I learn. I take out a summary in a Field Notes notebook in my camera bag, and refer to it often during the day. 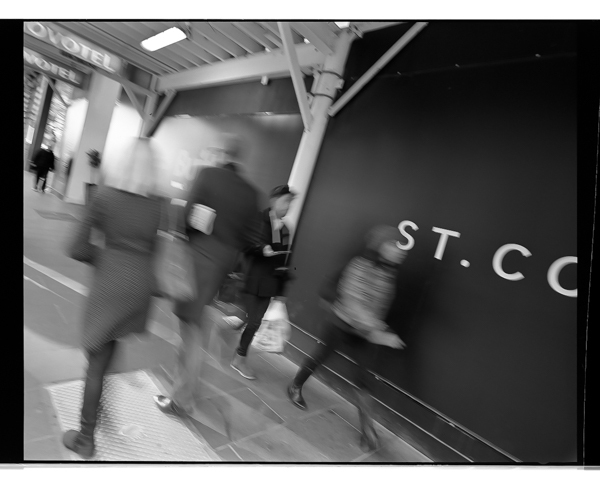 I was also interested in really cracking on to hyperfocal distance and zone focusing which I cover off here. 2. Review your results critically. Self curation is a critical element of learning. Unless you are cashed up and doing a photography degree (which probably means you are doing it for a job, which is nowhere near as much fun!) you are going to have to learn a lot on your own. The first thing is to both enjoy your photos, but also to be very critical of them without crushing your spirit! So, here are my photos along with some curation critique. I had a very wide angle 43mm lens on a medium format body. I set the ISO at 1600 (pushed up two stops from ISO 400 to ensure the shutter speed was as quick as possible. 1/125 is the minimum to target for anything reasonably sharp. The 43mm lens had a great minimum focus distance when set to f8. About a metre or so? The only downside was the light wasn’t always bright enough during the day. 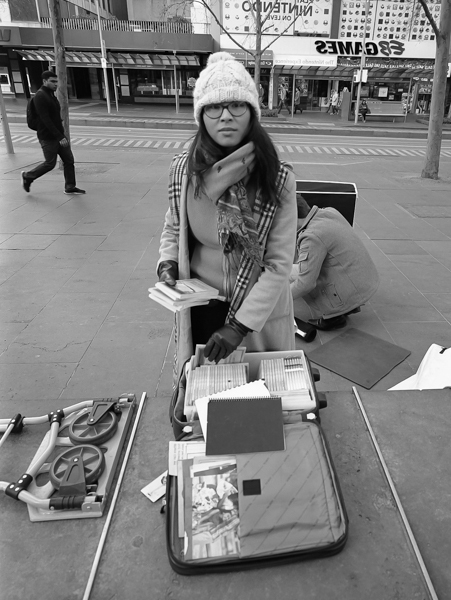 I saw these missionaries setting up in the city for the day and just walked up and shot just as the girl looked up – a little surprised by me, I think, but I just smiled and moved on immediately before she could think about it too much. The zone focus on f8 worked pretty well in this shot. Another zone focus experience. 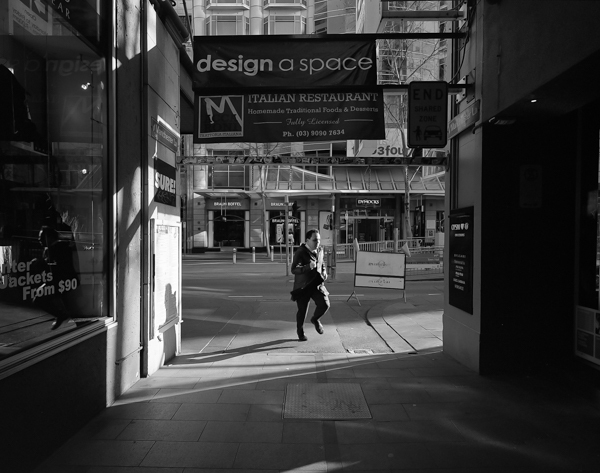 I found the spot first, an entrance to Melbourne Central, where the light was perfect. It was then just a wait until the right subject came along. The camera was set prior to the shot – both the framing and the focus – all I had to do was pull the camera up to my eye and shoot. There were three or four shots that worked here, but this subject’s slightly “unco” feet make the composition interesting. Zone focusing again here – but the shot opportunity was also quite driven by another previous session I had done on storytelling. 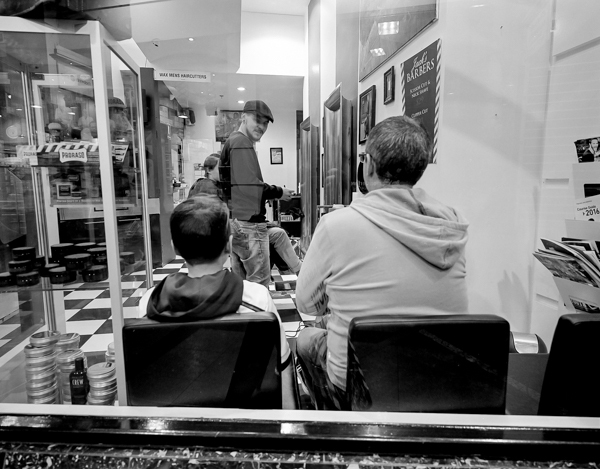 The kid and dad waiting for a haircut here was pretty cool, although the shot is a bit over complex which makes it a little hard to see at first. 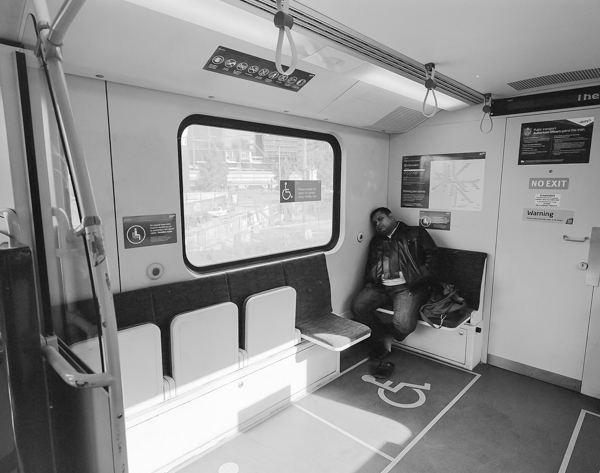 I was also thinking about storytelling here, along with making the most of the wide angle lens. Getting more into the shot adds to the story a bit. Although it may have also been interesting to shoot him right up close using the wide angle and contrasting him against the window? This subject was just a little close – less than a metre – but I have included it as it is still aesthetically pleasing. A reminder that you don’t always have to sweat the focus. The subject was actually quite short and I was able to shoot downwards on to her, making for an interesting angle. Just a nice shot which resulted from finding the frame first and then waiting for the right subject. Winogrand often used a downward perspective to create interest. 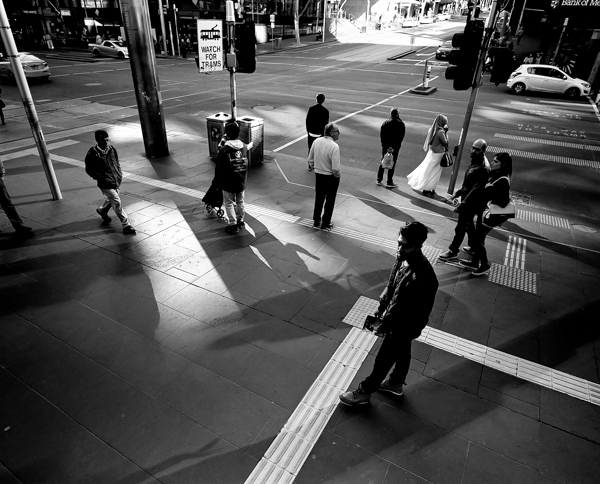 This spot I have used before – the corner of the GPO building standing up on the ledge. Last time I was there, I used an 80mm lens on the same camera. 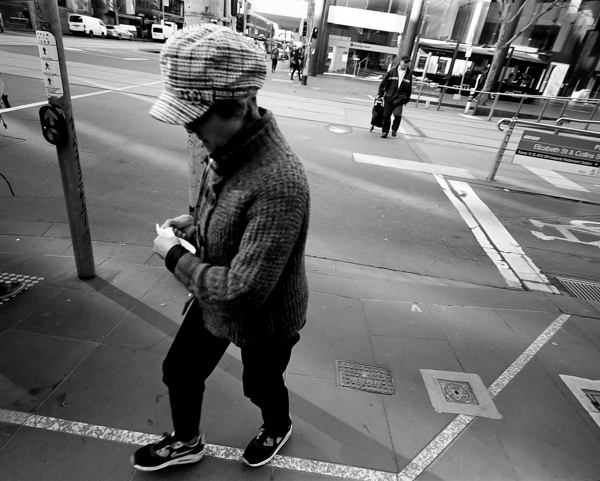 This time, with the wide angle, more of the wider scene comes into the frame, and creates a broader feel of the street. The angles of the textured footpaths feel a little more prominent. Story telling again. 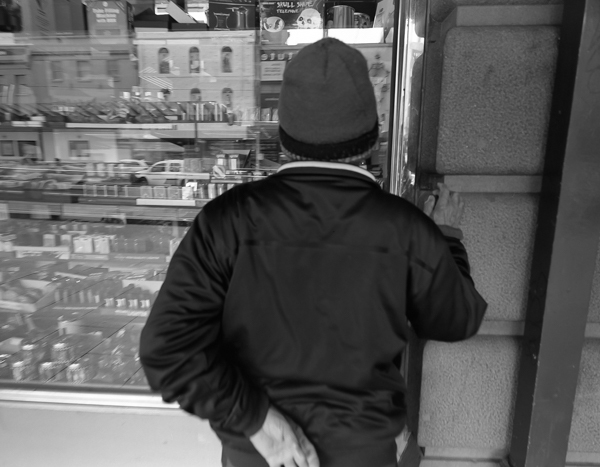 This time it is a guy looking into a tobacco store window. I love the idea of this image, but it is poorly executed. Either I stuffed the focus distance or the shutter was just too slow to give a sharpish result. A polarising filter to remove the window reflections would have also helped to really highlight what the guy was looking at. A quick photo opportunity, and then I continued moving. Zone focus, on the train this time. Didn’t quite get it right for the female subject, but it still works nicely as an image. I love people who still read books. 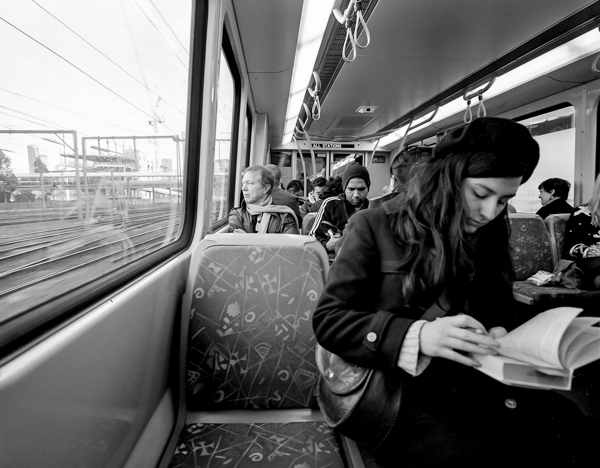 I don’t generally shoot anyone who is focused on their phone, but people reading books are some of my favourite people! I need to spend a bit more time on this particular technique. I hope this gives some kind of insight into my personal approach to learning. 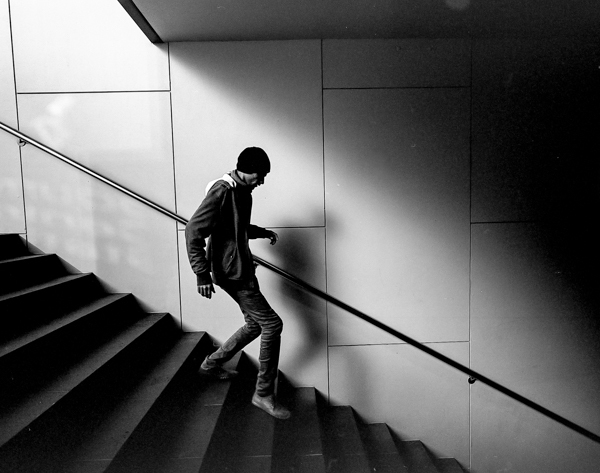 I have posted ten images here from a total of nine rolls. There were a possible ninety images to shortlist from. I only focus on a short list for learning. There are only two that I would short list as possibles for an exhibition or book – the first two. Or maybe none of them? One or two ripper images a month is a pretty good scorecard. Thanks Eddie – I will be in town (assuming you are Hong Kong based?) later in the year. Keep in touch! Nice to hear from you Alan! I don’t normally publish a lot of “maybes” but thought it was worth it for this post. Thanks for the feedback. FWIW, I really like number 7, there’s a sense of movement & the lighting is great.